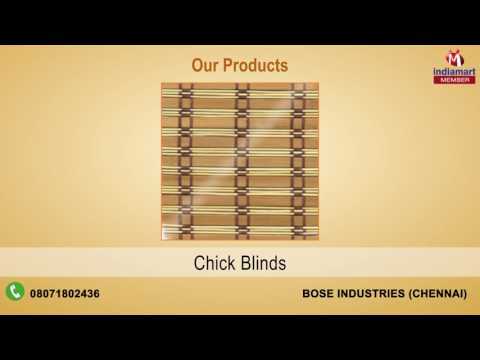 Incorporated in the year 2008, at Chennai, (Tamil Nadu, India), we, %u201CBose Industries,%u201D have emerged as a trustworthy trader and supplier involved in offering optimum quality Indoor-Outdoor Furnishing Products. Our product portfolio includes elegantly designed Decorative Awnings, Roller Blinds, Chick Blinds/ Wooden Blinds, Vertical & Venetian Blinds, Carpets, Tarpaulins, Canopies, Vinyl Flooring and Wooden Flooring. Offered in a wide variety of colours and designs, these are extensively demanded for their domestic and commercial applications. Banking on our rich vendor base, we are capable of feeding bulk orders in the shortest possible time frame.